How do we calculate the energy transfers in an electrical appliance? What do we mean by a unit of electricity used? How do we calculate the cost of running an electrical device? Note: You may/may not (but don't worry! ), have come across all of these terms, it depends on how far your studies have got. In your course, you might not need every formula - that's up to you to find out. V the potential difference (p.d., commonly called 'voltage')) is the driving force that moves the electrical charge around a circuit. The p.d. across any part of a circuit is measured in volts, V.
I the current = rate of flow of electrical charge in coulombs/second (C/s), measured in amperes (amps, A). R a resistance in a circuit, measured in ohms (Ω). A resistance slows down the flow of electrical charge. P the power delivered by a circuit = the rate of energy transfer (J/s) and is measured in watts (W). Appreciate that we often use electrical appliances because they transfer energy into other useful at the flick of a switch ie very convenient! Energy is transferred because the electric charge does work against the circuit resistance(s) - remember: work done = energy transferred. Electrical appliances are designed to transfer to do useful work in a circuit when the current flows through the components of e.g. heating element of a fire or kettle (electrical energy store to a thermal energy store), motion in a food mixer (electrical to a kinetic energy store) etc. Don't forget that no appliance is perfect (100% efficient), so there are always energy losses. The greater the current flowing, the greater the energy transferred to the thermal energy stores of the components and of course, wasted heat energy to the surroundings. Just think of all the devices-appliance that run off electricity in the home. Lots of other stuff working off electricity ... Iron, immersion heater, telephone, internet etc. etc.! Try to imagine life without your domestic electricity and think how wonderful 240V is! Quite simply the convenience and usefulness of mains electricity to our way of life and standard of living is incalculable, so don't waste it! Electrical appliances can be low or high power - convenient for the energy needs required to power most things in the home. Think of all those everyday tasks now done more conveniently with electrical appliances, saving your time and energy. Even with lighting, electric bulbs are rather better and safer than oil/gas lamps or candles! Powerful electrical machines in industry are easily run from mains electricity and can do jobs far more quickly than manual labour. This has allowed the efficiency of industrial production to be considerably increased. Steam power replaced people and steam replaced by electrical power - the power aspect of the industrial revolution! Lifts require a powerful electric motor and think of the hard work you do in climbing several flights of stairs! Know how to calculate how much energy is transferred by an appliance and how much the appliance costs to run. You will be required to compare different electrical appliances, using data provided. This may involve energy use and cost effectiveness and also to consider the implications of instances when electricity is not available. For developing countries where infra-structure lacks a reliable mains electricity supply, battery operated devices can be used and even clockwork radios have been designed. However, batteries are costly despite being a convenient supply of stored chemical energy which converts to electrical energy on demand. They also don't last very long! In the case of a clockwork powered radio, when the radio is 'wound up' the energy is stored as elastic potential energy and again released as needed to listen to the radio, for free! This completely avoids the need for costly batteries and their safe disposal to avoid pollution. Without mains electricity, communities in developing countries cannot have the same standard of material living. You should also be aware that some energy is 'wasted' or 'dissipated' because electrical appliances are never 100% efficient when switched on! The waste energy usually ends up increasing the thermal energy store of the component or surroundings e.g. from friction of moving parts or heat from overheated circuits. In fact, if a resistor increases in temperature, its resistance increases and even more energy is lost. Also, the greater the current flow, the greater the thermal energy losses (see the National Grid system for a 'big' example!). Despite the wasted energy in many appliances, there are obvious instances where we want the electrical energy to end up as heat. Electrical heaters is the most obvious example - you use a high resistance a coil of wire to act as a heating element in an appliance e.g. electric fire, toaster etc. In both these cases, the resistor becomes so hot it glows red - electrical energy store of circuit ==> thermal energy store of resistor ==> infrared radiation ==> thermal energy store of food to cook it or to warm up the surroundings etc. The thin metal filaments of filament bulbs need to become very hot to emit useful light. Fuses rely on an 'overheating' effect to protect an appliance and ourselves from electrocution. The electricity supply to your home is a.c. (alternating current) where the current constant reversing direction e.g. an oscillation of 50 Hz (50 cycles/second). The a.c. supply to the ring mains circuits in your house originates from the National Grid system. Alternating currents are produced from alternating voltages in which the positive and negative terminals of the potential difference keep alternating (+ <=> -). The a.c. mains supply in the UK is usually around 230-240 V with a frequency of 50 Hz (50 hertz or 50 cycles/second). Other devices will use a d.c. (direct current) supply from cells or batteries, in which the current only flows in one direction e.g. torch batteries. A d.c. current is produced by a direct voltage - potential difference (p.d.) and is either positive or negative, but NOT both. You can convert an ac current into a dc current using a diode. Many electrical appliances in the home are connected to the ring mains circuit with three core cables fitting into a plug. The plug (pictures below) is inserted into a socket which is directly connected to the a.c. mains supply. Most sockets have their own switches connected to the live wire of the ring mains circuit in a house. This enables the circuit to be broken and isolate any appliance if there is a risk of electric shock. The cables consist of a copper wire core and sheathed in an insulating plastic covering, each of which is colour coded to clearly indicate its function (annotated image below). The colour coding is kept the same for all appliances so that you know exactly which wire is which! If wired incorrectly you may blow the fuse or have an accident - potentially fatal electrocution (see earth wire), so make sure you know which is which and how to wire a plug safely irrespective of any GCSE physics exam! The function of each of the three wires in a three core cable. The live wire provides the alternating current potential difference with a p.d. of +/- ~230-240 V.
The live wire carries the p.d. directly from the mains supply and this 'live' wire must never be touched if the circuit is switched on for obvious reasons! In fact you should never touch or manipulate any wire if the circuit is live! The neutral wire completes the circuit to the appliance and carries away the current. This allows the current to flow in through the live wire (maximum p.d. of ~230-240 V) and out through the neutral wire (minimum p.d. ~0 V). The p.d. between the live wire and neutral wire is ~230-240 V for the mains electricity supply. The earth wire has a safety function to protect the wiring and YOU! It doesn't normally carry a current and its p.d. should be 0 V.
The p.d. between the live wire and the earth wire is ~230-240 V.
There is no p.d. between the neutral wire and earth wire, both are at 0 V.
The earth wire is connected to the metal casing of an appliance and carries the current away safely if a fault develops in the circuit. If a fault develops and the live wire touches any conducting part of the appliance, the current will run to earth through the earth wire and NOT through you if you touch the appliances. This also might, and should, blow the fuse because of the surge in current, so the circuit is broken and made safe. Under normal conditions your body has a p.d. of 0 V with respect to the ground ('earth'). Unfortunately, if you touch the live wire with the circuit switched on, a potential difference is produced across your body and the current flows through you to the ground - 'to earth'. In other words, you will experience electrocution - potential injury from an electric shock, and, if the current is large enough, it may kill you! It doesn't matter whether the appliance is switched on or not, if the plug is in the socket, there is a connection to the live wire which always has a p.d. of ~230-240 V! If there is any low resistance connection between the live wire and earth wire a sudden huge current can flow to earth, which is dangerous. This is the cause of many house fires due to a faulty connection where lots of heat is produced. For more on electrical safety see live wire and fuses notes. Most appliances are labelled with a power rating, which is the maximum power output with which it can be used safely. The power rating tells you the maximum amount of energy transferred from one energy store to another per second when the appliances is being used. e.g. a 700 W iron means 700 J of energy are being transferred (used) every second. A 3 kW heater transfers to the thermal energy store of a room at the rate of 3000 J/second. The power rating is useful information for the consumer. The lower the power rating, the less electricity it uses, saving money - cheaper to run - as long as the appliance can still do what you want it to do. e.g. if 500 W iron can do the work in the same time as a 750 W iron, then the 500 W iron is the more efficient and cheaper way to do your ironing! 750 - 500 = 250, so 250 J/s is saved to the thermal energy store of the clothes being ironed. Whatever the power rating, its the efficiency of the appliance that is really important - what percentage of energy input is transferred in doing useful work. However, beware!, just because an appliance has a higher power rating, it doesn't mean it is more efficient than a lower power appliance. A higher powered appliance might waste more energy i.e. has lower % efficiency in terms of the electrical energy doing useful work. For more see electrical power calculations section. Apart from electrical power calculations for electrical appliances, this formula is needed to calculate a safe fuse rating. With respect to an external electricity supply, as with the earth-ground itself, your body is at a p.d. of 0 V.
Unfortunately, this means if you touch the live wire or anything connected to it, a large p.d. of 240 V occurs across your body i.e. between you and the 'earth'. Therefore an electrical current will flow through you, giving you an electric shock, which can be sufficient to kill you. Even if the socket switch is 'off' or appliance is 'switched off' there is still a danger of an electric shock because the live wire is still at high pd (eg 240 V). If the live wire is touched you are still in grave danger of an electric shock because a current can still flow through you to 'earth'. (i) Wearing electrically insulating rubber boots may offer some protection, but is that what you normally wear!? (ii) Water is a poor conductor, but with a high potential difference it can conduct. You should also remember from your chemistry (electrolysis) that ions from salts increase the electrical conductivity of water and you have salt ions in your blood, cells and nervous system etc.! (iii) It is the function of fuse to protect you and the appliance from current surges (next section). In any household or industrial circuit, you can get sudden surge (increase) in current. The current surge maybe due to a fault, but even switching appliances on and off. A current surge due to a fault can lead to overheating, damaging the appliance or even causing a fire. An appliance is fitted with an earth wire and a fuse in the live wire. If a fault develops and the live wire comes into contact with the metal case, then, as long as the metal case is 'earthed' (connected to the earth wire) the current surge flows harmlessly from the live wire, through the case and down the earth wire to earth. The current surge should melt the fuse, as long as the correct fuse rating is used, and the current surge is over the fuse rating (in amperes). This is why the fuse must be connected in the live wire! Once the fuse has melted the circuit is broken and the live wire supply is cut off. This isolates the whole appliance so you cannot get an electric shock from touching the case. Fuses rely on an 'overheating' effect to protect an appliance from damage (e.g. so it might be repaired) and ourselves from electrocution from a high voltage current running through our body to earth. If the temperature of a resistor becomes too high from a current surge causing overheating, the resistance increases and so does the heat transfer to its thermal energy store. This may interfere with the working of an appliance due to the increase in temperature of a resistor. The temperature might rise sufficiently to melt the wire in a circuit component and the break in the circuit stops the 'device' working. This is how a fuse works, if a fault develops and too much current flows, a fuse wire melts from this overheating effect, this breaks the circuit and makes it safe. The larger the current in the appliance the thicker the wire should be to minimise the resistance and overheating. Generally speaking the fuse rating increases with increase in cable thickness. (i) As well as appliances, the ring main circuits to the 'plug in' sockets and lighting are protected with fuses in the same way. (ii) You can protect circuits with circuit breakers (sometimes called ?). There are several types of circuit breakers e.g. some work off the magnetic effect of a solenoid so that a current surge produces a magnetic field strong enough to make a magnet open two contacts to break the circuit. Circuit breakers are safer than normal household fuses. A wire does not melt, but the circuit is broken by a fast 'switching off' action - faster than fuse melts. They also have the advantage of being reset, which is less trouble than fitting a replacement fuse. They are however, more expensive, but safer! Fuse ratings and how to you choose is the safest to use? For domestic appliances in the home the most common fuse ratings in the UK are 3A, 5A, 8A and 13A. The fuse should have a rating of close to, but, just above the maximum safe current that will run through an appliance. If a fault develops, and the current rises a few amps above expected, the fuse must melt and break the circuit making it safe. Example 1. A 2kW electric fire works of a 230 V ac mains supply of electricity. Calculate the current flowing in the appliance and suggest a suitable fuse rating. Ideally a 10A or 11A fuse would do, but its likely that in this case the appliance would be fitted with a 13A fuse. Obviously, you choose the nearest fuse rating from what is available. Example 2. What fuse would you choose to put in the plug of a 700 W electric iron working off 230V mains electricity? 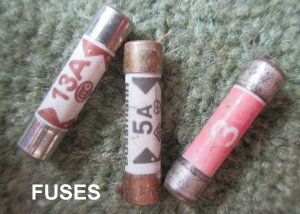 Ideally a 4A fuse would be best, but a 5A would be acceptable. To protect you from electric shock, all appliances with metal cases should be earthed i.e. the metal case is connected to the earth wire, using three core cable as previously described. An earthed conductor can never become live. A metal casing is obviously an electrical conductor, but if the appliance has plastic casing (electrical insulator) with no external metal parts that can be touched, it is said to double insulated. This means the appliance doesn't need an earth wire and so is connected with two core cable - live and neutral wires only. Know and appreciate examples of energy transfers that everyday electrical appliances are designed to bring about. Know that the amount of energy an appliance transfers depends on how long the appliance is switched on and its power. The quantity of electricity that is transferred ('used') in an appliance depends on its power and how long you use it for ie time its switched on. Since a joule is a very tiny amount of energy, we often quote power in kilowatts (P in kW). A bulb might be quoted with a 50W rating (50 J/s), an iron might be quoted as having a 500 W or 0.5 kW power rating (500 J/s, 0.5kJ/s) and a three bar electric fire might have a 3kW power rating (3 kJ/s, 3000 J/s). However when dealing with large amounts of electrical energy its more convenient to think and calculate in kilowatt-hours (kWh). 1 kilowatt-hour = the amount of electrical energy that a 1 kW appliance uses in 1 hour. In fact, in terms of the electricity use in a house, the term unit on your electricity bill means a kilowatt hour and the price will quoted as eg '9p per unit', in other words you will pay 9p for every kilowatt-hour of electrical energy you use. Three formulae for calculating power, energy transferred and other things too! P in W or J/s, I in amps A, V p.d. in volts. The more energy transferred in a given time, the greater the power of the device. The p.d. V tells you how much energy each unit of electrical charge transfers (V = E/Q, J/C, see section 3 for E = QV calculations). The current I tells you how much charge passes a given point in a circuit per unit time (coulombs/second, C/s). This means both p.d. and current affect the rate at which energy is transferred to an appliance from the electrical energy store to another energy store. Q1 A 2 kW electric fire is connected to a 240 V supply. Calculate the current flowing through the electric fire. Q2 The current flowing through an electric motor is 12 A. If it operates of a 24 V battery, what power does the electric motor generate? Q3 What p.d. must a power supply have, to produce a power output of 2 kW from a machine through which 12.0 A flows? Q4 A p.d. of 12.0 V is applied across the resistor of a device with a power of 8.0 W.
Calculate the current flowing through the device. P in W or J/s, I in amps A and p.d. in volts, R in ohms Ω.
Q1 A current of 20 A passes through a resistance of 10 Ω. What power is the circuit generating. Q2 A 2.0 kW electric fire has 4.0 A running through this heating appliance. Calculate the resistance of the heating element. Q3 A 20 Ω electrical device transfers energy with a power of 500 W.
When electrical charge moves through a potential difference energy is transferred as work done against the electrical resistance (p.d.). The energy of the charge comes from the power source (dc battery, ac mains electricity) which raises the potential energy of the electrons. The charge, (usually electrons), 'falls' through the p.d. across the components of a circuit, giving up its electrical potential energy to another energy store e.g. thermal, or other form of energy e.g. sound or light. If you increase the p.d. or the current flowing through a circuit, the more energy you can transfer in a given time. (1st) The usual and familiar J, W and s.
Q1 An 800 watt oven is used for one and a half hours. How much energy in MJ is transferred to the thermal energy store of the oven? Q2 An electric heater transfers 1.5 MJ of energy every minute. Calculate the power of the electric fire in kW. Q3 A rechargeable battery can deliver a total of 8.0 MJ of energy to a device. If the device delivers a power output of 25 W, to the nearest hour, how long can it be used for? Q4 The p.d. across a resistor is 24.0 V. If a current of 3.0 A is flowing, how much energy is transferred in 5 minutes? time = 5 x 60 = 300 seconds. Q5 A 1200 W toaster is used for a total of 10 minutes. How much energy is transferred in this time? (2nd) The practical everyday units e.g. on an appliance or electricity bill. The power formula triangle for the units of power in kilowatts (kW), units of energy in kilowatt-hours (kWh) and units of time in hours (h). Be able to calculate the cost of using mains electricity given the cost per kilowatt-hour. You should know this includes both the cost of using individual appliances and the interpretation of electricity meter readings to calculate total cost over a period of time. (a) What is the cost per week of using a 40W light bulb for 36 hours in a week? It doesn't seem a lot, but throughout a house it soon adds up, so always switch unwanted lights! (b) What is the cost of doing a single wash in a machine rated at 2.5 kW if it takes 30 minutes to complete the washing and spin drying cycle? (c)(i) Ignoring the standing charge, what is the quarterly bill cost to a household that uses 650 units of electrical energy in three months? (c)(ii) If the family wants to cut the cost of the quarterly bill to £60, what is the maximum number of units of electrical energy they can use? (d) How long could you run a 500 W plasma TV screen for 20p? Check out your practical work you did or teacher demonstrations you observed, all of this is part of good revision for your module examination context questions and helps with 'how science works'. plan and carry out an investigation using an electrical joulemeter to measure the energy transferred by low voltage bulbs of different powers, low voltage motors and low voltage immersion heaters.